Here’s a sneak peek of latest angel. 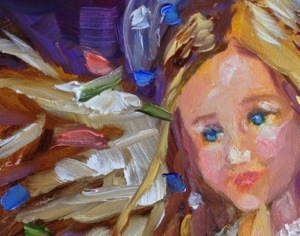 I will have all my new angel paintings in my 2012 Christmas angel series featured at Smellie Bloomers Christmas Open House Sunday, November 11, 2012. I will be on site painting, mark your calendar! but all of them are wonderful. lovely paintings…. I yearn for oils again. Love it! Can’t wait to see the finished product.